Invented for your Pet; decreases muscle stiffness and increases range of joint motion; recommended for the symptoms of canine hip dysplasia. Most flexible of all long models and for those who are taller than 5 10" or lack flexibility who want to treat all their own major muscle groups. For Seniors and those who prefer a light massage. 26-inches or 66cm. This is the longest of all the Sticks, for those who are taller than 5 10" or lack flexibility who want to treat all major muscle groups. 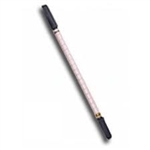 Firmest of the long Sticks, which makes it the most versatile, for it allows a light to a very deep massage. Length: 30 inches or 76cm. The Little Stick is the shortest of all Sticks. It is ideal for traveling and perfect for the treatment of calves. It is highly effective in the management of growing pains and shin splints; light to medium deep massage.. Length: 14 inches or 36 cm. The Sprinter Stick is the firmest of the short Sticks, primarily used on legs and fits in most bags. Length: 19 inches or 48 cm. The Body Stick is the original Stick and the most popular model for the average build. Standard flexibility, designed for the average body mass. Length: 24 inches or 61cm. The Marathon is ideal for long distance runners and cyclists. It is short and flexible for those who prefer light massages. Length: 20 inches or 51 cm. Featuring standard flexibility, the Travel Stick is the short enough to carry while on the move. Great for portability; primarily used on legs. Length: 17 inches or 43 cm. Features a centered wheel for target application. Great for digging into the gastroc, behind the knee, neck, rhomboid and forearms. Length: 23 inches or 58 cm. Second longest of all the Sticks. The Power Stick is for those who are taller than 5 10" or lack flexibility who want to treat all their own major muscle groups. Standard flexibility. Length: 27 inches or 68cm. Firmest of all of The Sticks. 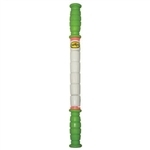 The Stiff Stick is for those who love / need deep massages; by pressing lighter, you can simulate a light massage. It is a favorite of most athletes; if you are up to 5 10" and flexible, easy to use by yourself on all major muscle groups. Length: 24 inches or 61cm. A companion to The Stick, the Trigger Wheel features a single 2" nylon wheel with a 1/4" oval treating surface. It is especially effective in areas too small or too difficult to be reached by The Stick; great for neck, traps, pecs, forearms etc. Length: 5 inches or 13 cm. The FootWheel was developed to soothe tired, achy feet in seconds. Great for the bottom of your feet - developed to soothe tired, achy feet in seconds. A must in the management of plantar fasciitis. Length: 4 inches or 10 cm.